sleep-wake homeostasis, or Process S, the accumulation of hypnogenic (sleep-inducing) substances in the brain, which generates a homeostatic sleep drive. Both of these processes are influenced to some extent by the genes of the individual. In addition, various external factors (e.g. food, drugs, ambient temperature, meal times, naps, stress, exercise, daily schedules, alarm clocks, etc) can also have a direct or indirect effect on an individual’s sleep-wake cycle. The body’s built-in circadian clock, which is centred in the hypothalamus organ in the brain, is the main mechanism that controls the timing of sleep, and is independent of the amount of preceding sleep or wakefulness. This internal clock is coordinated with the day-night / light-dark cycle over a 24-hour period, and regulates the body’s sleep patterns, feeding patterns, core body temperature, brain wave activity, cell regeneration, hormone production, and other biological activities. Even a long sleep might be ineffective (or at least inefficient) if it occurs at the “wrong” time of the circadian cycle. See the following section for more details on Circadian Rhythms. But circadian rhythms alone are not sufficient to cause and regulate sleep. There is also an inbuilt propensity toward sleep-wake homeostasis, which is balanced against the circadian element. Sleep-wake homeostasis is an internal biochemical system that operates as a kind of timer or counter, generating a homeostatic sleep drive or pressure to sleep and regulating sleep intensity. It effectively reminds the body that it needs to sleep after a certain time, and it works quite intuitively: the longer we have been awake, the stronger the desire and need to sleep becomes, and the more the likelihood of falling asleep increases; the longer we have been asleep, the more the pressure to sleep dissipates, and the more the likelihood of awakening increases. 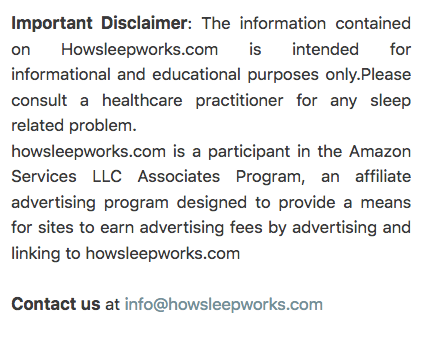 See the following section for more details on Sleep-Wake Homeostasis. While homeostatic sleep drive typically increases throughout the day, effectively making a person more and more sleepy as the day goes on, it is countered and moderated by the circadian drive for arousal, at least until late evening, when the circadian clock slackens off its alerting system and begins sleep-inducing melatonin production instead. This opens the so-called “sleep gate” (marked by the point in the diagram above where the homeostatic sleep drive is at its greatest distance above the circadian drive for arousal). The exact way in which this occurs is still not fully understood, but the recent neuronal group theory of sleep theorizes that individual groups of neurons in the brain enter into a state of sleep after a certain threshold of activity has been reached, and that, once enough groups of neurons are in this sleep state, the whole organism falls asleep. During the night, while sleep is actually being experienced, the homeostatic sleep drive rapidly dissipates, and circadian-regulated melatonin production continues. In the early morning, melatonin secretion stops and the circadian alerting system begins to increase its activity again. 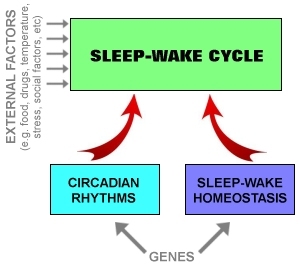 Eventually, the point is reached where the circadian drive for arousal begins to overcome the homeostatic sleep drive (marked by the point in the diagram above where the two curves meet), triggering awakening, and the process begins all over again. While these are the two main processes involved, there are also other neurological mechanisms at work, including the suppression and re-activation of the everyday alertness signals of wakefulness, the switching between non-REM and REM sleep, the sleep inertia effect on waking, etc. Other external factors, such as ambient temperature, meal times, naps, stress and exercise, also influence sleep times and durations, as of course can our own willed behaviour and daily schedules (e.g. work, school, alarm clocks). The practice of consciously following daily guidelines in order to regulate these external factors and ensure a more restful and effective sleep is known as “sleep hygiene”, and can have at least a moderating or reinforcing effect on our underlying sleep patterns (see the separate section on Sleep Hygiene). In addition, certain drugs (e.g. antihistamines, barbiturates, melatonin, certain psychoactive drugs, marijuana, alcohol, etc) act as sedatives, encouraging sleep, although care should be taken as some of these may also inhibit REM sleep and lead to disrupted sleep later, as a “rebound” effect occurs. For example, alcohol functions as a sedative initially and may help some people to get to sleep, but after a while it has a strong stimulant effect and actually disrupts sleep. On the other hand, stimulants (e.g. caffeine, amphetamines, ecstasy, cocaine, nicotine, etc) can be used to reduce or delay sleep, but they too have their own unfortunate side-effects and delayed rebound effects, and many are potentially addictive. Certain foods and drinks, such as those containing tryptophan (e.g. bananas, dates, nut butters, seeds, tuna, turkey, yoghurt, milk) and foods high in carbohydrates like bread or cereal, may help encourage drowsiness and sleep. Conversely, foods containing tyramine (e.g. bacon, ham, pepperoni, eggplant, raspberries, avocado, nuts, soy sauce, red wine) may have the opposite effect and keep you awake at night. These effects should be taken into account as part of any sleep hygiene regime.